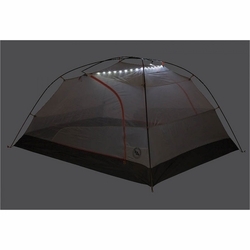 Big Agnes Copper Spur HV UL3 mtnGLO Tent. These full-featured, ultralight backpacking shelters are super easy to pack, setup, and inhabit. Dual doors make entry and exit convenient for all, and our award-winning mtnGLO Tent Light Technology makes overnights with friends and four-legged partners better than ever. With steep, vertical walls there’s enough internal space to ensure that windy, rainy afternoons spent playing Hearts won’t leave you feeling claustrophobic. Note: We list several weights for our tents to aid your product research. Trail weight refers to poles, fly, and tent body. Packed weight includes poles, fly, tent body, stakes, guy lines, stuff sacks, instructions, and packaging. Fast Fly weight refers to the poles, tent fly, and accessory Fast Fly footprint. Packed Size	6.5" x 21.5"
Your tent floor deserves some extra protection.